Over 40,000 industry professionals and visitors from 177 different countries of the world were present at COMPUTEX 2016 during its five-day run(photo courtesy of TAITRA). Retaining its global reputation as a great marketplace of tech innovations, COMPUTEX TAIPEI 2016 wrapped up on June 4 in Taiwan with resounding success in bringing together global technology companies such as ABB, Acer, Audi, BenQ, Cooler Master, MSI, SAMSUNG, Siemens, Mercedes-Benz, and many others with concerns about future development revolving around four major issues, namely IoT applications, business solutions, innovations and startups and gaming, which were exactly the major themes of this year's COMPUTEX TAIPEI, thereby accelerating its transformation from a simply ICT trade fair into one that aims to “build partnerships in internet computing ecosystems”. During its five-day run in TWTC exhibition halls and TWTC Nangan Exhibition Halls, the exhibition totally attracted 40,969 international ICT professionals to the show, an increase of 4.7 percent from last year, along with a large number of international visitors from 177 countries worldwide, growing by 9 percent. Top 5 countries that produced the greatest turnout of international visitors are China, Japan, USA, Hong Kong and Korea, according to show organizer, Taiwan External Trade Development Council (TAITRA), a semi-official export promoter. 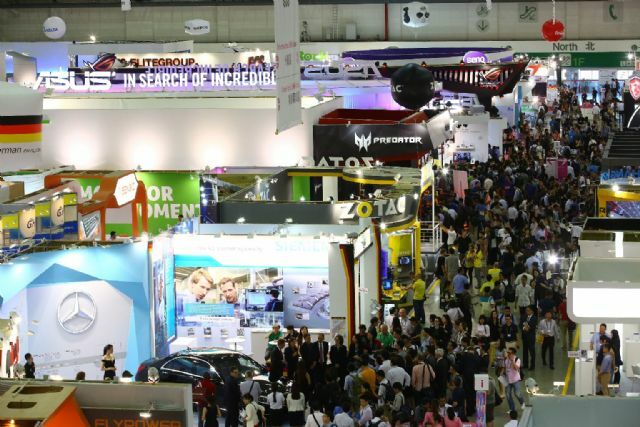 Continuously wielding its influence over the global tech industry, COMPUTEX 2016 kept growing in terms of turnout by hosting a total of 1,602 local and international exhibitors manning 5,009 booths, including 23% first-timers, and drew a great number of local and international buyers as it has over the years. Moreover, the arrangement by TAITRA of 822 1-on-1 procurement meetings that directly linked 188 VIP buyers with exhibitors to generate strong business potential also added extra sparkles to this year's COMPUTEX. The debut of InnoVEX, a brand new exhibition area focusing on innovations and startups, also created new dynamics at this year's COMPUTEX. Futuristic fabrications, event lineups on two stages, contests, and displays of 217 startups (including 25 award-winning teams) contributed their creativity and energy to attract 10,975 visits in three days. COMPUTEX continued to reinvent itself. For e-sports and gaming, COMPUTEX collaborated with HWBOT by holding HWBOT World Tour 2016 at COMPUTEX and invited global overclocking professionals to challenge hardware capabilities. Director of HWBOT Taiwan, Pieter Jan-Plaisier, said, “Great devices by gaming manufacturers in Taiwan and reputations of COMPUTEX attracted many overclocking masters to this debut event in Taiwan.” The Light Gallery of Taipei Nangang Exhibition Center, Hall 1 was redesigned into an overclocking arena for this unprecedented competition. Varieties of IOT applications on display were also a main feature of COMPUTEX 2016. At the venue, many exhibitors showcased their latest smart devices developed with all aspects of IoT to realize smart retail, integrating virtual reality, 3D printing and comprehensive business solutions. Perhaps one of the biggest hits with visitors, the chip giant Intel announced its collaboration with Hon Hai for developing various network infrastructure technologies, fully demonstrating the importance of COMPUTEX in the ICT industry and how IoT will lead the next wave of industry revolution. Besides IoT developments among established industry leaders, COMPUTEX 2016 also celebrated innovations and startups at InnoVEX zone, where invited startups from all over the world showcased their ideas to solicit investments and find regional distributors. A concomitant event, InnoVEX Pitch Contest attracted 102 participating teams from 17 countries with financial incentives and experienced judges. After three rounds of elimination, MoBagel beat other finalists to win the laurels in the contest, which is noted for being the only team from Taiwan selected in 500 Startups accelerator of 2015. Its proposed “Real-Time Predictive Analytics for IoT Devices” won most judge votes for its ability to predict big data analytics and combine artificial intelligence with connected home appliances for smart business forecasting. COMPUTEX not only offers the exhibits of supply chain and procurement platforms, but focuses on the breakthroughs of IoT. The CPX Conference, organized by TAITRA, consisted of world tech leaders. The lineup of the 2-day conference included: CEO of ARM, Simon Segars; innovation designer for Milan Candidate City Expo 2015 and one of three major futurists in the world, Vito Di Bari; Rahul Patel, Senior Vice President and General Manager of connectivity, Qualcomm; Steve Wyatt, Group Vice President of ABB Robotics; Erdal Elver, President & CEO of Siemens Ltd. Taiwan; Lucas Wang, CEO of HWTrek; Allan Yang, CTO of Advantech; Simon Wang, Senior Director of Internet of Things Business Development, TSMC and more tech executives delivering keynote speeches on IoT applications, ecosystem partnership, and innovative startups, attracting over 2,300 audiences. During the keynote, Simon Segard indicated, “IoT is no longer just an imaginary concept. Hardware-software integration will facilitate comprehensive solutions in various aspects. Under IoT ecosystem, technology, enterprise, platform and information integrations will enable more opportunities.” And Vito Di Bari pointed out; solid manufacturing capabilities in Taiwan had laid a solid foundation for technology innovations. It's important to connect with ecosystem partners to develop and expand influences. COMPUTEX continues to contribute to technology developments with insights from tech executives and futurists at CPX Conference. 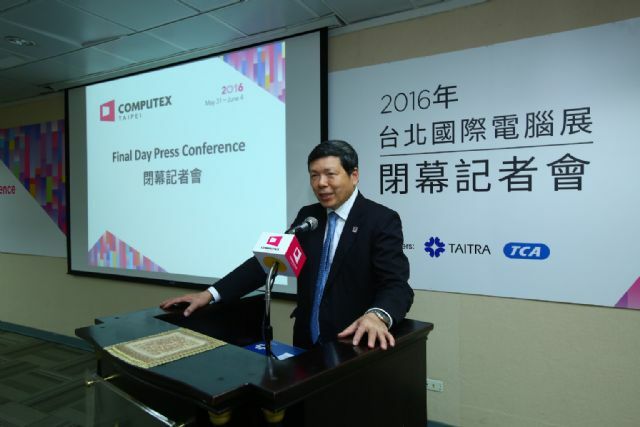 Executive Vice President Walter Yeh of TAITRA addressed the closing press conference on the last day of COMPUTEX 2016 (photo courtesy of TAITRA).